Xander: Xander. Is – is me. Hi. 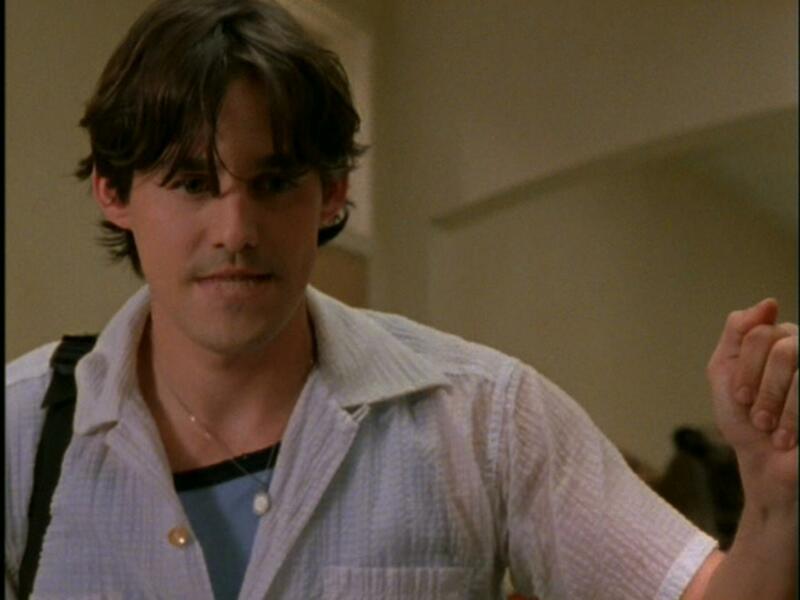 Xander: Well, uh, maybe I’ll see you around… maybe at school… since we… both… go there. Yes, it’s true, I was one of those kids who liked school. For the most part. I mean, I didn’t relish test-taking or being picked on or gym class but in general school was an okay thing. Sure, there were days I didn’t feel like getting out of bed, but since I was all right with the whole learning premise, it was pretty much a place to hang around with my friends for eight (or more, during theater season) hours per day. College was even better for these purposes — you get to live with your friends, and go to class when you feel like it. Once you’re in the real world, with a job, you start to realize how good you had it when you were in school…why do you think so many people go through the torture of grad school? They get slapped in the face by the real world and run back to class, where it’s safe and fun and your success or failure depends pretty much on your own efforts. Even those of us who stick it out in the real world, work our jobs, and get focused on our careers end up craving the classroom again eventually. Think about it. I bet you (or people you know) have taken various classes post-college. Did you take a writing seminar? A class on sauces at the local culinary school? A beginner’s photography class you found on craigslist? Salsa lessons at that bar down the street? What makes you decide to take a class? For me — and I’m betting for most people — part of it is an actual desire to learn something, maybe part of it is a desire to learn something specific, but part of it is the social aspect. It’s like the first day at a new school all over again: a little scary, incredibly exciting, and now you’ve grown into your skin and have confidence you didn’t have at the acne-dangerous age of fifteen. Who else will be taking the class? What will they be like? Will you have a chance to be popular, again or finally? This is the Good Stuff side to the rule we discussed last week, you know, the one about never ever ever leaving your first aid kit behind. While thinking about the injuries you might sustain on a solo hike or camping trip, or the other dangers out there can be intimidating, don’t forget that the key is to be prepared. And how can you get prepared, in a fun, exciting way that conveniently ties into this little musing about school? You can take a class! Last week I linked to the American Red Cross for first aid classes, but there are other organizations that offer them as well. Female self-defense classes became a rage a handful of years ago, and they are still offered all over, in varying levels of commitment, intensity, and difficulty. Classes don’t have to be limited to just safety, however; many local adult ed centers, the Appalachian Mountain Club, and other outdoors clubs offer hiking “classes” that usually involve a group hike. Just because you want to be able to solo hike and camp, or prefer to solo hike and camp, doesn’t mean that you can’t also get involved with the community, learn something, and get prepared. You can even be like Xander and meet some new people at class, since you both…go there. What classes have you voluntarily taken since leaving formal “school?” Why? What was good and bad about them?